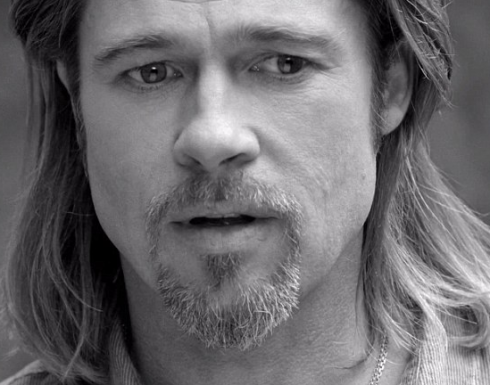 Everyone scratched their head a bit when Brad Pitt was named the face of classic women’s perfume Chanel #5, but whatevs. The commercials and ads are finally rolling in, and Brad frankly just looks tortured. In the tease for the Joe Wright-directed commercial, the A-list actor speaks meaningless “deep thoughts” over shots of two models who look a bit like ex Jennifer Aniston and fiance Angelina Jolie. They’re not lookalikes, but similarities don’t seem to be subtle. It’s definitely something they would have nixed if they weren’t intentionally trying to suggest the tabloid triangle between the three. “It’s not a journey, every journey ends… but we go on. Brad joins the ranks of Marilyn Monroe and Nicole Kidman in representing the fragrance. “What’s important to remember about Chanel N°5 is how revolutionary this fragrance is. When it was introduced, it broke all the rules by discarding meaningless ornamentation for an honest and open aesthetic, and a scent which embodies liberation from trend, creating a fragrance which remains as modern today as it was during its inception. Chanel N°5 has always been the most iconic women’s fragrance. Do you like Brad’s commercial? Do you think that’s intentially supposed to be Angie and Jen? Details on Angelina Jolie’s wigs, diet, and fitness training for Salt: Is she too skinny for action movies?